The video currently holds 172,189,383 million views on YouTube and has garnered a significant amount of attention on social media. Rife with relevant cultural symbolism directed at the violent and racially tone deaf society we live in today, it’s clear that Gambino is a force to be reckoned with — and he has a lot to say. There is quite a bit to unpack in this nuanced powerhouse of a video — from the lyrics of the song itself, to the cleverly hidden visual messages scattered throughout it. Watching “This is America” is a conflicting emotional experience. It shifts between being entertaining, unsettling, catchy, dark and above all else, poignant. All of the memes and remixes of it aside, Gambino shamelessly offers up a societal critique that’s just obvious enough to get people thinking about what it really means. From his very first appearance onscreen to his last, Gambino transitions through a slew of historical and cultural references centred on racial strife and uncensored violence. He dances across a warehouse with exaggerated facial expressions — reminiscent of mocking and racially disparaging minstrel acts — until he slowly pulls out a gun and lowers himself into a Jim Crow era pose, casually executing the guitarist, Calvin the Second, in front of him. Without missing a beat, he continues to make his way through escalating scenes of violence that carry on in the background, while black school children perform alongside him. Childish Gambino’s work is masterful in its execution and it has generated much needed discussion and attention regarding the numerous issues surrounding gun violence in America, along with the prevailingly indifferent treatment towards POC and police brutality. They are a collective distraction against the muted scenes of brutality playing out behind them and Gambino’s intentional construction of this disparity becomes increasingly apparent as the video progresses. Perhaps the most shocking moment occurs when he emotionlessly guns down an African American choir with an assault rifle — a probable reference to the 2015 Charleston shooting committed by a white supremacist that resulted in the deaths of nine black church members. The victims in the video are treated with little sensitivity as they are dragged out of view and disregarded entirely, while the guns Gambino uses in each instance are handled with care — immediately taken away from him to be wrapped up attentively. He contemplatively pauses with his hands poised purposefully as if he were aiming a gun, only to retract and light himself a joint before climbing on top of a dated car to break into a dance once again. This particular moment is one which people have noticed mirrors a banned scene from Michael Jackson’s “Black or White” music video, the similarities between the two being notable when you consider their collective meaning. As the camera pans out to show other older cars and a grooving Gambino fading out of focus, he stops suddenly and looks up — the music shifts as a staccato beat similar to the sound of gunshots carries over into the video’s final moments. It’s here that we see Gambino for what he’s been reduced to and what he represents — a faceless black man running away in fear. No longer a caricature or an entertaining placeholder, he’s a person of colour escaping what can be seen as an inevitable end since the time of slavery to the day and age we live in now. 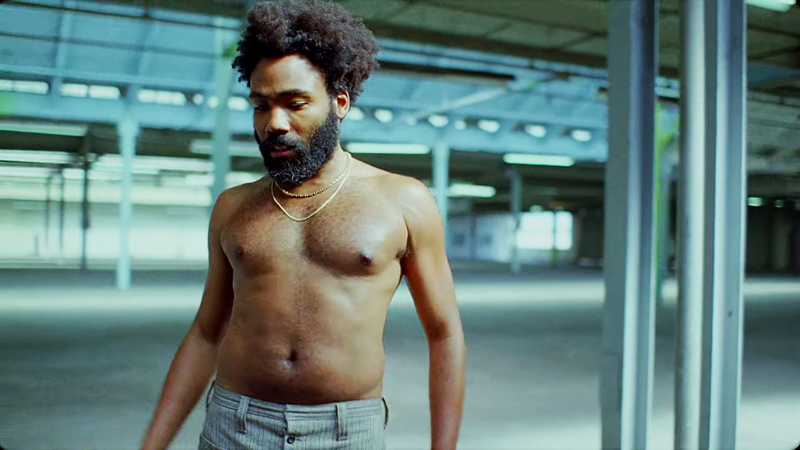 From unabashed symbolism surrounding America’s disposability of black lives, right down to his subtle clothing choice that closely resembles a pair of Confederate army pants, Childish Gambino proves that he isn’t afraid to make a statement — setting the bar remarkably high for the musical artists who follow him.